What’s the Equivalent of Ctrl+Alt+Delete on a Mac? If you switch to a Mac after becoming familiar with Windows, you’ll quickly find that the standard Ctrl+Alt+Delete shortcut doesn’t do anything. Mac OS X does have its own version of the Task Manager, but it’s a bit different than Windows’, and you access it by pressing Command+Option+Esc. 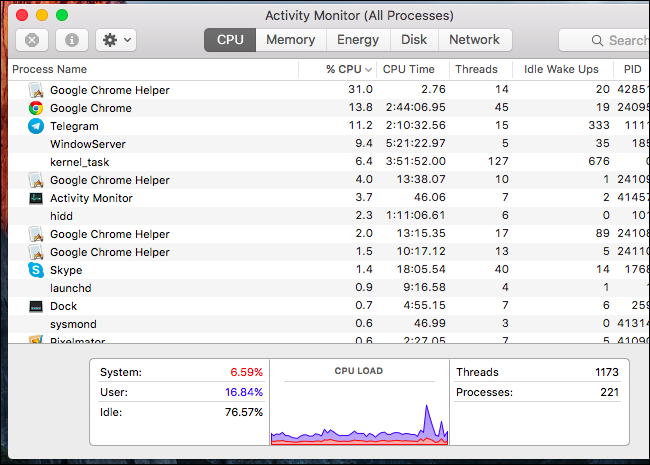 While Windows’ Task Manager contains a wealth of information and features, OS X splits some of those features up into separate apps. The Force Quit dialog, which you access with Command+Option+Esc, allows you to close misbehaving applications much like the Ctrl+Alt+Delete Task Manager in Windows. However, if you want more in-depth information info about your running applications and overall system resource usage, you’ll want to use the separate Activity Monitor application. If an application is frozen on your Mac, you can use the Force Quit dialog to close it. This is particularly useful when using a full-screen application, such as a game, and your Mac doesn’t seem to be responding. To open the Force Quit dialog, press Command+Option+Esc. This should work even if a misbehaving application has taken over your screen and your Mac isn’t responding to other keyboard or mouse actions. If that shortcut doesn’t work, you’ll likely need to forcibly shut down and restart your Mac. To force your Mac to shut down, press the Power button and hold it for several seconds. You should only do this if your Mac can’t shut down normally. Scroll down in the list and select the misbehaving application you want to close. Click the “Force Quit” button and your Mac will forcibly close that application. There are also other ways to force quit a misbehaving application. For example, you can press and hold the Option and Ctrl keys and click an application’s icon on your dock. (You can also press and hold the Option key and then right-click an application’s icon on your dock.) Select the “Force Quit” option that appears to forcibly quit an application. If an application isn’t responding and you click the red “Close” button on its title bar several times, you may also see a prompt window asking if you want to force-quit the application. The Force Quit dialog takes care of closing misbehaving or frozen applications. However, it doesn’t allow you to see how much CPU or memory different applications are using, get an overview of your system’s overall resource usage, or other statistics like Windows’ Task Manager does. This window displays a list of your running applications and other processes. You can view information about their CPU, memory, energy, disk, or network usage–click a tab at the top of the window to choose which. From the “View” menu, you can select which processes you want to see–just your user account’s processes, or every running process on the system. Overall system resource statistics also appear here. The CPU, Memory, Energy, Disk, and Network tabs all show how much resources all the processes on your computer are using in total. You can close applications from here, too–just select an application in the list, click the “X” button at the top-left corner of the toolbar, and select “Quit” to close the application normally or “Force Quit” if it isn’t responding. For more info on how to read all the information in Activity Monitor, check out our guide. If you’ve used the Task Manager on Windows 8 or 10, you’ll know that it also allows you to control which startup programs launch when you log into your computer. OS X also has a similar tool, but it’s not included in the Force Quit or Activity Monitor tools. 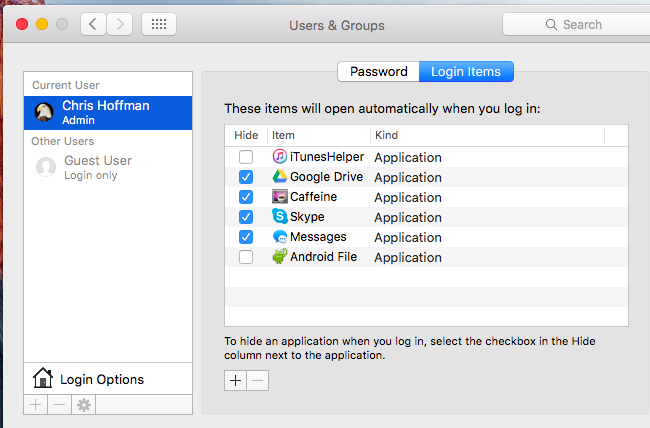 To manage startup programs on your Mac, click the Apple menu and select “System Preferences.” Click the “Users & Groups” icon in the System Preferences window. Select the user account you want to manage–your own user account, probably–and click the “Login Items” tab. Applications that are checked in this list will launch when you sign in, so you can uncheck them if you don’t want them to launch automatically. You can drag-and-drop applications from your dock or Applications folder to this window, too–if you do, they’ll be added to this list and will automatically open when you sign in. You may have Ctrl+Alt+Delete burned into your brain for a catch-all when something goes wrong. If you ever get into trouble on your Mac, Command+Option+Escape will open the Force Quit dialog and serve a similar purpose. For everything else, you have Activity Monitor and System Preferences to help you out.